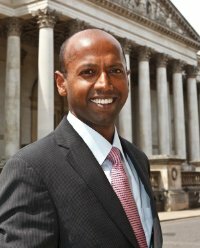 Navi Radjou, an innovation and leadership strategist based in Silicon Valley is the co-author of the bestselling book, “Jugaad Innovation: Think Frugal, Be Flexible, Generate Breakthrough Growth”. His book was touted by the Economist as “the most comprehensive book yet to appear on the subject”. Let’s hear from Navi at EMC’s GRIP event. “Innovation is a major directive at corporations worldwide. But how do you drive innovation and growth as the global business landscape becomes increasingly unpredictable and diverse? The answer: jugaad. Jugaad is a Hindi word meaning an improvised solution born from ingenuity and cleverness (think of it as the “MacGyver” spirit). Jugaad is the secret formula of successful grassroots entrepreneurs in emerging markets such as India, Africa, China, and Brazil who are able to innovate faster, better, and cheaper in the midst of high complexity. For the first time in the U.S., you will learn how to apply the frugal and flexible principles of jugaad in your own organization to accelerate growth and outperform competition. The GrassRoots Innovation Program (GRIP) is a Bay-area series of seminars, lectures and panel discussions featuring well-respected leaders & innovators from a diverse set of industries and careers. Speakers discuss their leadership styles, personal visions, and strategies for success while reflecting on their views around leadership and innovation. GRIP is sponsored by EMC, but attendance at GRIP events is open to anyone regardless of employment status or company affiliation. This entry was posted in Innovation Thought Leadership and tagged EMC, EMC Women's Leadership Forum West Coast, GrassRoots Innovation, GRIP, innovation, Jugaad Innovation, Merissa Hamilton, Navi Radjou, Sheryl Chamberlain, WCWLF, WLF, Women's Leadership on February 23, 2013 by Sheryl Chamberlain. Somebody essentially assist to make seriouslly articles I might state.